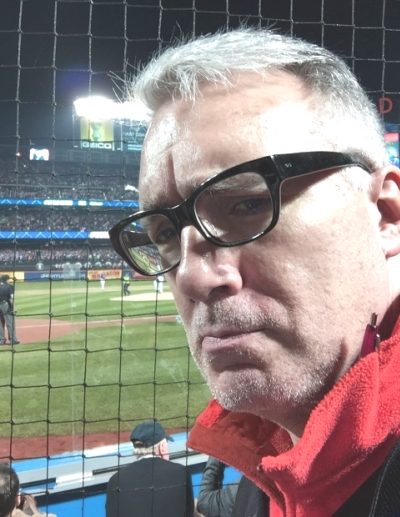 KEITH OLBERMANN, anyone? If you’re thinking outside that batter’s box thing, he’d be fearless if asked to jump in because he would understand that, if you’re trying to put yourself in someone’s blazer, we aren’t talking about finding someone who has to “replace” Scully someday, if that’s the actual job description. No one, of course, will do that. Think of the publicity that would generate. Btw, the hat has "flashing LED. Somebody made them for half a dozen teams in '06 I think. They lost their shirts. Uni is EFF 1910 amateur Mets." LOL, he hates to shave. Is that a ballpoint clipped to his collar? (that's 50th) consecutive repetition of this annual ritual. Who's the turkey Keith describes in para 14, I wonder? 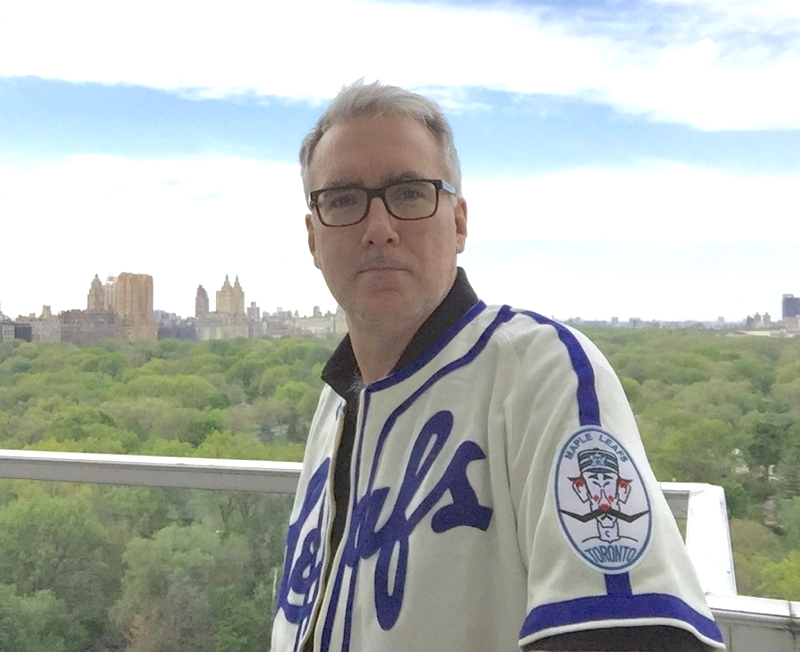 Keith Olbermann tells stories about the real man behind the voice of the Dodgers. ON FRIDAY, April 9th, 2004, Royce Clayton of the Colorado Rockies -- his new dreadlocks cascading out from under his helmet -- strode to the plate at Dodger Stadium to lead off the top of the 8th. Far above him, broadcasting perhaps his 8,500th ballgame, Vincent Edward Scully thought of something. "You see Clayton's hair and you think of Johnny Damon," Scully said, pausing, to let the mental image form of how Damon had that season added a long flowing brown beard to his long flowing brown hair. "You seen pictures of Johnny Damon in the papers? Red Sox outfielder?" This kind of aside had long been a standard Scully ploy: utilize an endearing anachronism to help the viewer or listener live up to Scully’s subtle-but-powerful demand that they work hard at multi-tasking and follow not just his broadcast of the game but also his sidebars, which flow like the Mississippi -- and he’s Mark Twain, piloting the riverboat while he's telling you stories about life deep in the woods behind the banks. "Two-and-oh. Holy Mackerel! I tell you who he reminds me of. Only me, now." There was no actual pause before what came next. But to all of us watching Vin Scully do just another Dodger regular season game, time stopped to allow us to try to guess where Vin was going with this. One of his viewers -- me -- at home and under the covers, well past midnight in New York (and thank you baseball satellite package), assumed he would make the obvious, but perfect, analogy between the hair and beard of Johnny Damon and the hair and beard of Jesus Christ. In that split second I was wondering how in the hell he’d do it without leaving the possibility of offense, because in broadcasting today if you’ve gone 67 days without offending anybody you’re either a dreadful bore or a master of collegial decorum, and Vin Scully has gone 67 years without being a dreadful bore or offending anybody. Forgive me the self-conscious writing conceit of returning to the start of what Scully said during that otherwise forgotten April game twelve years ago, so you get the flavor of the thing and the full impact of him not invoking Jesus: "You see Clayton's hair and you think of Johnny Damon. You seen pictures of Johnny Damon in the papers? Red Sox outfielder? Two-and-oh. Holy mackerel! I tell you who he reminds me of. Only me, now. Charles Manson!" Scully cracks himself up for a second and there's a welcoming cough-like grunt subsuming part of the next consonant. "How'd you like to have somebody say you look like Charles Manson? I’ve got his bubble gum card, right? Gee whiz! Oh well." The self-deprecating laugh vanishes suddenly now in the one-second pause, and Mark Twain is back focused on the riverboat’s wheel. "Five-one Dodgers in the eighth…"
The recording of The Night Vin Scully Talked About Charles Manson has been with me ever since, and to those I meet who have not heard it, it now, in 2016, provides even more of a happy shock than it did twelve years ago. Because now, as Scully's retirement looms, he has seemingly been so buried in deserved praise and honest gratitude that one almost visualizes him having to wade his way through it to get to his broadcast booth at Dodger Stadium. As the years have piled up he has gone from being Brooklyn Boy Wonder Announcer to Inventor of Los Angeles Baseball to The Game's Greatest to Icon to Saint Sportscaster to, this year, something approaching Living Deity. This is not to say Vin Scully is not a terrific and endlessly patient human being, nor that anyone who has treated him with reverence, nor that the succession of ballplayers and managers who have bestowed the ultimate role-reversal praise by making the pilgrimage in full uniform to him in the press box are being insincere or overdoing it. It's just that the real Scully -- the one who once made us think not of Christ but of Manson -- is far more human and far more capable of the unexpected. And thus far more praiseworthy. He's not as good as everybody's making him out to be; he’s better. Of course, I can write that now, 29 years after I first met him. 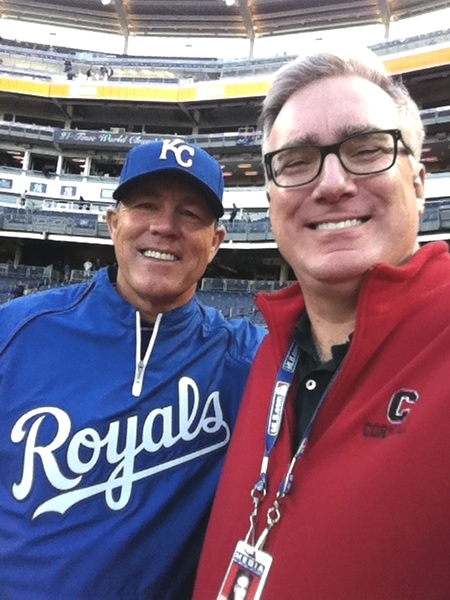 It should be 31 years after I first met him, but honest-to-God, the first two years I worked in Los Angeles as a full-time sportscaster on a top-rated local TV newscast and on all-news radio, I could not manage to screw up the courage to introduce myself to him. At fourteen or so, required in a composition class in a suburban New York prep school to write an essay on what I would do if I knew I had six months to live, I had included in my farewell tour going to Los Angeles to meet Vin Scully. So when I finally dismissed the element of Final Wish to the thing and made that same pilgrimage to him before a game -- with my heart beating in my ears -- he responded with something so kind and self-deprecating that I was certain I wasn't the first professional to have been that flummoxed in his presence. "I'm glad you said hello! I thought I had done something to offend you!" Before I could sputter any kind of reassurance, he began to quiz me about anniversaries of obscure but interesting baseball events which I used to drop into my sportscasts. I explained I had found a perfect book that sorted them not by year but by month and date. "Goodness! Really? By date? Could I borrow it? Would you mind if I did something like it during the telecasts? Just Dodger anniversaries?" I remember stifling an instinct to look around to make sure he wasn't talking to somebody of actual importance standing behind me, and shortly afterwards getting a thorough physical to make sure I didn't actually have just six months to live. The pilgrimage has only taken on its finality this year -- we were lined up in the hallway on the June night I finally got to Dodger Stadium about 6:15 and cued up to say goodbye -- but within the broadcasting industry it has for decades been almost universal, and mine is not even the sappiest of the Too-Scared-To-Introduce-Myself stories. In 1999, the Yankees played an exhibition game in L.A. and a friend of mine had to overcome his nerves just asking me if I would introduce him to Vin. 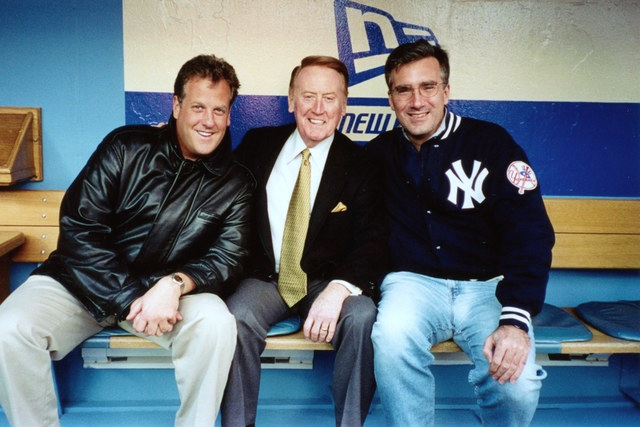 The friend was named Michael Kay and he was in his eighth season as a Yankees' play-by-play announcer, and like Scully he was an alumnus of Fordham University, and thus his bona fides were several times better than mine. Before I introduced them, Mike said, "I'm shaking like a leaf." After Vin exited, Mike said, "I'm still shaking like a leaf." And all Scully did to calm him down was tell the shockingly human -- and theretofore untold story -- of how he had been approached to bolt the Dodgers in 1964 to become a Yankees' announcer. As Kay and I blinked silently in disbelief, Vin revealed even more. "And I thought long and hard about it. I was born in the Bronx. We had only been here six, seven seasons. It was tempting." Other pilgrimages have been punctured in blunter fashion. 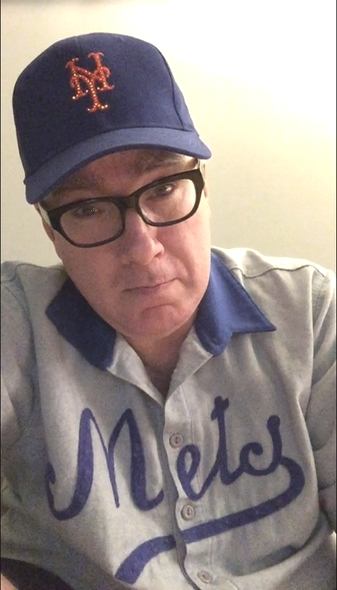 Amateur archivists still strive to confirm the exact date and list of witnesses when Scully, having a pre-game meal in the tiny press box dining room just up the first base line from his Dodger Stadium booth, listened impassively to a group of sportswriters go on about how the personal lives of a single woman reporter and a local married athlete had unfortunately and very publicly intertwined. Suddenly Vin reddened and said, "Just tell me one thing" -- and proceeded to inquire with vivid non-Dodger blue language about why the respected part of the couple had gotten involved with the less-respected one. It's possible one of the sportswriters is still seated at that table, having turned into a statue with jaw permanently agape. Legendary is the story of the blustery political commentator who years ago had "his people" advise the Dodgers he wanted to meet Scully because Scully was "number one" in his field. "Everywhere I go, Mr. Scully, I try to meet whoever is Number One because I'm Number One in what I do and it's important to recognize and salute those of my own stature, and you're Number One here!" The man bellowed on like this for several moments as the crew in the Dodger booth squirmed. When he finally paused, too impressed with himself to sense Scully's anger, Scully quietly, politely, and efficiently cut the blowhard into little pieces. "Well then, you'll want to meet Arthur here, who is our Number One stage manager." The commentator found himself unwillingly shaking hands. "And of course, you’ll want to meet Debbie, she's our Number One makeup artist." Another unhappy handshake. "And Don, our Number One cameraman -- who, coincidentally is on Camera Number One." Again with the handshake. "And in the row behind you, that's Antonio, our Number One intern…" Witnesses disagree as to how many Numbers One Scully introduced before the man angrily muttered "I gotta go" -- but all agreed he was several feet shorter when he went. So Scully is many things, but mild-mannered saint is not one of them. I have listened to him talk, mystified and hurt, about the conduct of a baseball Hall-of-Fame player towards him, and heard him bemused at a previous broadcast employer's attempt to remake the look of his telecasts ("They could ask me what it should look like, couldn"t they? I mean 50 years in, maybe I've had one idea of some value?"). I have heard him use other salty language and am one of the few witnesses left to tell thee of the time he hosted a television game show. These non-beatified versions of Scully aren't extraordinary and given how long he's been doing this, statistically they are probably few and far between. His longevity sometimes escapes our ability to contextualize it. It is amazing to contemplate that he joined the Dodgers only three years after Jackie Robinson did, and was in the booth for the first ballgame Mickey Mantle ever played in New York. It is startling to realize the on-air audition he had — and didn't pass -- to become John Madden's TV partner was 35 years ago this month. It is mind-bending to consider that he has not just been on 22 of the 94 annual radio and television World Series broadcasts ever, but been alive for 87 of them. It is goose-bumpy to recognize that the season he began broadcasting major league games, Connie Mack was still the manager of the Philadelphia Athletics (Mack had become A's manager in 1901 and we've just passed the 130th anniversary of Mack's debut as a major league catcher). And it almost requires the language of Light Years to realize that if you start a new job the day after his last scheduled regular-season Dodger broadcast and you stay in that gig as long as Scully has in his, you will not be leaving your new position until Sunday, September 26, 2083. You will also have to be almost flawless at that job over these next 67 years. Lost in the pilgrimages and the longevity is the reality that unlike almost every other great broadcaster in any field and of any time, there is not only no long list of Scullyian Gaffes, there is almost no list. Amid the Kirk Gibson call, and the Bill Buckner call, and the Hank Aaron call, and the Larsen Perfect Game call, and the Koufax perfect game call -- there just aren't many mistakes. Certainly, a few years back he confused Koufax and Clayton Kershaw, and this past June he advertised an upcoming Dodgers-Nationals pitching match-up as Kershaw versus Stephen Spielberg. Naturally, two days later, Vin turned it into a priceless callback and a subtle reference to Broadway understudies by saying, "The other night I think I said Stephen Spielberg. But I regret to say he is unable to pitch." But these and the occasional slightly-garbled name or detail are all the result of age, and even if they were not, the average major league play-by-play man probably makes as many of them a season as Scully has in a lifetime. Yet if there is one memory of his work that I will always carry with me -- besides, of course, Charles Manson Night at the old ball yard -- it is of an actual Vin Scully on-air mistake. On a miserably humid night in Cincinnati in August, 1991, with Dodger catcher Mike Scioscia at bat, Scully abruptly announced "The two-oh pitch to Hodges…"
"Hodges" was Gil Hodges, the Dodger first baseman from before Scully joined the club through the 1961 season, later manager of the 1969 "Miracle" Mets and as of that night buried -- in Brooklyn -- nearly 20 years after a fatal heart attack at just 47. The mistake was so unexpected that it was actually noted in the pages of The Los Angeles Times. And that night, during the Dodgers' telecast from San Francisco, Scully came on the air and owned up to it. I foolishly didn't keep the tape from that night and I seek it still, so you’ll have to accept a paraphrase. Scully came on camera, mid-game and said (approximately), "I'm told that back home today a mistake I made the other night appeared in one of the papers. I had been thinking of the late Gil Hodges. If you don't know, Gil Hodges was a great Dodger first baseman, and my great friend and a great man who was taken from us far too soon. And like Mike, Gil wore number fourteen. And it was awfully hot in that booth and for some reason instead of saying, 'two-and-oh to Scioscia' I said, 'two-and-oh to Hodges.' But I think the weather and the uniform number were not the only reasons I confused them. Mike reminds me a lot of my friend Gil and, like Gil, I think he may be a fine major league manager some day. Anyway, I just wanted to apologize for the mistake." And then Vin Scully did something that took my breath away. As the booth light went off and the telecast showed the Giants and Dodgers on the field at old Candlestick Park and the sounds of Scully switching from a hand-held microphone to his headset rustled in the background, he said something that only Vin Scully could ever say, that would turn an ordinary stumble into a timeless moment. "I wish," he almost whispered, "I could bring Gil Hodges back that easily." 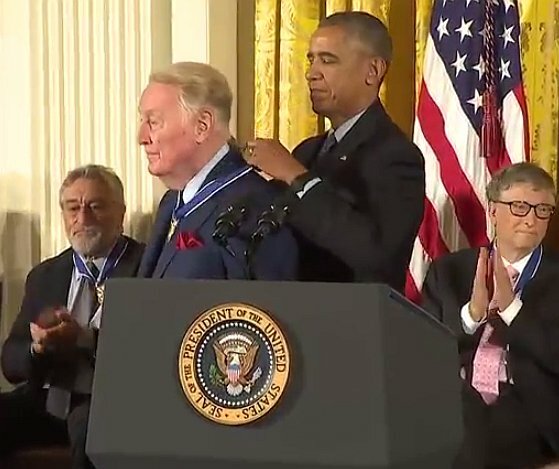 So happy for Keith to see his fav baseball announcer receive the Medal of Freedom! Marie wrote: Who's the turkey Keith describes in para 14, I wonder? But I really don't know if that story is true, since I never heard it before from anyone else. 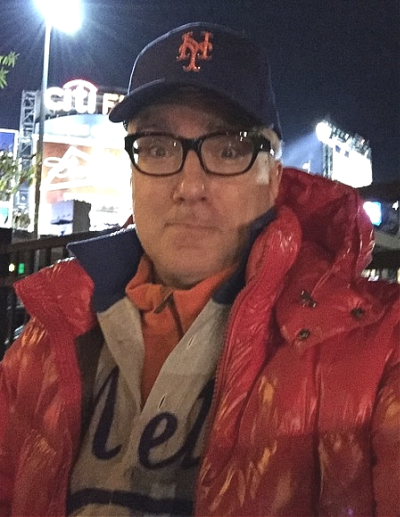 So Scully is many things, but mild-mannered saint is not one of them. . . .
Yeah, it's a bit of baseball lore, but it fits with Keith's own experience with the subject. I assumed the hapless "blustery" person was Donald, on account of the ref to a "Number One" this or that, but he wasn't a political commentator, so... probably Billo. April 15th is the date that MLB honors Jackie Robinson by requiring all players to wear Robinson's No. 42. Keith Olbermann discusses what Robinson dealt with as a player. In earlier heads-up, Keith notes, "([T]hey said my ID graphic reading 'ESPN 1992-97; 2005-07; 2013-15; 2017' would take up too much screen)."